Groundhog Day was my great-grandmother Loflin’s favorite holiday. I have no idea why she was so fascinated with this day. It’s really not a holiday at all, but rather a celebration. I do remember vividly how excited Grandma Loflin would be to find out Punxsutawney Phil’s prediction for the end of winter. Ironically, she died on Groundhog Day 1963. After all these years, the arrival of February 2nd always makes me think of her. In 1993, the movie Groundhog Day was made starring Bill Murray. As soon as I heard of it, my interest was piqued and it quickly became one of my favorites. I love watching Murray’s character, Phil Connors, transform from a selfish, womanizer into a warm, caring individual. Against his opposition, Connors is assigned to cover the annual Groundhog Day festivities in Punxsutawney, Pennsylvania. A major snowstorm forces the crew to spend another night in the small town. Connors awakens to find that it is again Groundhog Day. He is forced to relive Groundhog Day repeatedly, with seemingly no end. He reacts initially with anger, violence, and even by committing suicide, only to reawaken to yet another Groundhog Day celebration. Eventually Connors stops fighting his new reality and begins to change. 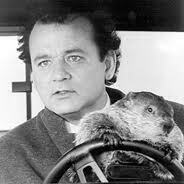 He uses each new Groundhog Day to learn more about the members of his news team and to fall in love with the people of Punxsutawney. He becomes the polar opposite of what he had been. He genuinely cares for people and goes out of his way to help others. In fact, by the end, he is the most loved man in town. Phil Connors went through a time of suffering and testing to become a man he was meant to be. God brings trials and tests to our lives to help us become the people he wants us to be. If we fail the test, He brings another one our way. As we pass each test, we become more mature and take another step toward completion. The trials refine our character and increase our hope in Jesus Christ as our Lord and Savior. It took Phil Connors a long time to grow and mature into a warm, caring man. I pray that I respond to God much more quickly and that I allow the trials God sends my way to refine and purify me. Everyone messes up from time to time, probably more often than we care to admit. I try to make a joke at lunch and end up hurting someone’s feeling. The prank you play on your friend goes awry and she winds up needing stitches. I fail to give my full attention to driving and cause a fender bender. Unless the mistake has larger consequences. Unless the mistake results not in embarrassment or damage that is easily repaired, but rather in broken lives and broken relationships. Such as the mistake Karen Harper made. Restorations is the story of Karen Harper’s journey to find forgiveness and a second chance at love after turning her back on God and damaging her most important relationships. It’s been two years since her husband’s death. Karen knows that he would still be alive if she hadn’t…well it’s just too painful to think about. Karen knew her actions were wrong but she never imagined the pain they would cause. Hoping to escape her past, Karen moves to Fredericksburg with her three sons. She has a new job that she loves and she’s dating Kevin, a man she met on the Internet. Although Karen thinks Kevin may be “the one,” her oldest son, Trevor, hates him. Of course, Trevor hates everything these days and he barely speaks to Karen. He blames her for everything that’s wrong in his life. When the nightmares start, she realizes she will have to deal with her past and forgive herself for her mistakes before she can hope to move forward with her life. As Karen allows God back into her life, she finds the forgiveness she desperately needs. Then God begins the work of restoring the broken relationships in her life. In contrast to Karen Harper, Kevin Peterson hasn’t made any big mistakes in his life. He knows he’s not perfect, but by almost anyone’s standards, he’s a pretty good guy. He’s an honest car salesman, a loving son, and a loyal friend. Kevin is doing just fine without religion or God in his life. In Reconciliations, God shakes up Kevin’s life to show him his need for a Savior. Kevin has to learn that “all have sinned and come short of the glory of God” and that no one can ever be “good enough” on their own. Kevin’s life is going along pretty well except that he’s been unlucky in love. Christine, his ex-wife, left him three years ago after he caught her with another man in his bed. He dated Karen Harper for a while until she got religious. Religion might have helped Karen deal with her past, but Kevin wanted no part of it. He’s glad to have both women out of his life. With a single phone call, God brings both women back into Kevin’s life. This is more than Kevin can handle. He needs help. It arrives in the form of Pastor Mark Vinson. As Kevin spends time with Mark, and members of his congregation, he begins to see himself in a new light. And he doesn’t like what he sees. When Kevin admits that he, too, is a sinner, he is finally ready to be reconciled with God. Karen and Kevin acknowledged their errors and confessed them to God, and they accepted His forgiveness of their sins. When they did, they found peace and hope. You’ve made mistakes, too. We all have. Perhaps, like Kevin, you’ve been able to brush your mistakes aside and convince yourself that you are one of the good guys, but you know deep inside that you can never be good enough. Or maybe, like Karen, you cannot escape your mistakes; they haunt you day by day and make you feel worthless. It doesn’t have to be like this. You don’t have to ignore your mistakes or be troubled by them. Remember there is hope. You have another option. You can confess your sins to God and accept His forgiveness. Then you, too, can have true peace and the hope that God has great plans for your life. When I was a high school math teacher, one of my students made a statement to her classmates along the lines of “High school is the best time of our lives, people. You better enjoy it.” I challenged her assertion and explained that she had so many wonderful events in her life ahead of her—college, marriage, and children just to name a few. When she thought it over, she could see that the sentiment she expressed was actually very negative. Yet, I’ve heard adults make the same comment to their high school children. For many people high school was a wonderful experience, and they look back wistfully on that period when they had lots of free time to spend with their friends and they were still under the protection of their parents. Unfortunately, however, high school is a very tough time for many other teenagers. Some teens struggle with making friends and feel like they don’t fit into any groups. Teens are pressured to wear the right clothing and hairstyles. Girls may be teased for being overweight or not fashionable, and bullies pick on smaller, weaker guys. Even the athletes and beauty queens are pressured to live up to worldly standards of physical perfection that are unrealistic. It’s no wonder that many teens struggle with low self-esteem. In writing and in working with girls in my church, I am passionate about trying to help girls and women discover their truth worth as children of God. For 32 years, I have been privileged to work in my church’s Girls Ministries program. I became involved in this ministry while I was in college. My 8-year old sister volunteered me to teach a group of younger girls so they wouldn’t be in her class. I was available, so I agreed to serve. It wasn’t long, however, before I realized that Girls Ministries would be one of my life’s missions. The Girls Ministries program exist to introduce girls to Christ and to help them find their place and purpose in life. One of the primary goals is to help girls realize that they are loved and esteemed by God. Their worth and value as human beings has nothing to do with their abilities, their actions, or their appearance. They are valuable because God created them and loves them. I once heard a preacher say that the most profound message of God’s Word can be summed up in “Jesus loves me this I know, for the Bible tells me so.” Jesus loves me and Jesus loves you. He loves each and every girl, regardless of her appearance, her background, her home life, or the mistakes she has made. This is the message we desire to impress on the heart of each girl. John 3:16 is perhaps the best-known verse in the Bible. “For God so loved the world, that He gave His only begotten Son that whosoever believes in Him should not perish, but have everlasting life.” God loves each girl and His love is so great He sent Jesus to die on the cross for her sins, so that she can spend eternity in Heaven with Him. Of course, the girls hear this message in Sunday School and church. So, why do they need Girls Ministries? I believe that Girls Ministries is important for girls to learn how to fulfill God’s purposes for them as women. Girls need a place where they can meet without boys present. Girls Ministries affords girls an opportunity to be themselves without trying to impress boys and to discuss concerns that should not be discussed in mixed company. In a girls-only environment, we address sensitive issues such as dating standards and sexual purity. We teach them to apply makeup to enhance their appearance and to dress modestly, so as not to tempt boys to have inappropriate sexual thoughts about them. We give them tools to recognize verbal or physical abuse and encourage them to date only Christian young men who share their beliefs and who treat them with respect and courtesy. We also teach girls that they will make mistakes and they will have to ask God to forgive them. When they seek forgiveness, God forgives. However, they may still have to live with the consequences of their mistakes. “For I know the plans I have for you, declares the Lord, plans to prosper you and not to harm you, plans to give you hope and a future.” (Jeremiah 29:11 NIV) Each girl in our program learns that God has a wonderful plan for her life. She can achieve this plan if she follows the instructions in God’s manual. God’s commands are not to restrict her, but to allow her to live life as fully as He has planned for her. A girl who appreciates this truth will not struggle with self-image or lack of worth. She will realize how valuable she is to the one who created her and she will grow into a confident young women equipped to fulfill God’s purposes for her life. Cancer and unemployment are the difficult things in my life right now, and grandchildren are the phenomenal blessings. Through these ups and downs, I am learning to trust God and am reminded that he is with me through all the circumstances of life. A year and a half ago, Steve and I were blessed with the news that our first grandchild was expected. That joyful announcement came at a time when we really needed some good news. We were approaching the first anniversary of Steve being laid off, and his parents’ health was of great concern. The expected baby was a reminder of God’s great love for us. The intervening months were stressful as Steve’s unemployment stretched into a second year and his father passed away. Whenever I felt like life was just too difficult, my spirits would be lifted be the mere thought that a baby was on the way. Daniel’s arrival ten months ago brought great joy to our lives. We love that little boy with all of our hearts. We thank God daily that he is a healthy, happy child. About six weeks ago, we learned that my sister has breast cancer. Although they caught it early and the tumor was rather small, the cancer had spread to her lymph nodes and has been diagnosed as an aggressive form. Fortunately, the cancer has not spread to her organs. She is facing months of chemotherapy and radiation treatments. It will be a difficult time. I will do all that I can to support her, and I pray that she will experience God’s presence in a new and powerful way as she deals with her illness. My sister’s cancer diagnosis, along with Steve’s continued unemployment—now well into its third year—can be a heavy burden to bear. The past few weeks, these burdens have felt overwhelming at times. I know I have to trust God for my sister’s health and my husband’s job situation. He is faithful to send bits of encouragement to remind me of his faithfulness. For example, one day last week the number of page views of my blog was unexpected much higher than normal. I was delighted. The next day was even better, setting a record for my highest number of views in one day. It wasn’t a big thing, and it didn’t change any of the circumstances of my life. However, God used this small thing to remind me of his love for me and to help me feel relevant. I called my sister today to share with her some unexpected good news Steve and I received yesterday. She shared with me that the original diagnosis of Stage 1 cancer had been overly optimistic; after her lumpectomy, the cancer was reclassified as Stage 3. God knew that I would receive this discouraging news today, so yesterday he sent us the good news another grandchild is on the way. Little Daniel will be getting a cousin in December. The new little one is due on December 27th. A Christmas baby to look forward to! It doesn’t improve my sister’s health or increase my husband’s opportunities for gaining employment. It does, however, remind us that we are blessed and have a great future ahead of us. We will continue to trust God for the strength to face each day with grace, knowing that his love for us is immeasurable. I Serve a Risen Saviour! Today is Good Friday. It marks the celebration of the greatest act of love that the world has ever known. Jesus Christ, the son of God, paid the price for my sins on the cross at Calvary. Without Jesus’ sacrifice, I could not have forgiveness for my sins. Thankfully, Jesus’ death was not the end of his life. Jesus battled Satan and overcame death and the grave. On Sunday we will celebrate Jesus’ resurrection from the grave. How wonderful it is to serve a Saviour who not only bore my sins but who is alive forever more. In celebration of Jesus’ death and resurrection, I am sharing one of my favorite Easter hymns. I hope that each person who reads this has received Jesus’ free gift of forgiveness of their sins and the promise of eternity in Heaven. If you have not done so, please consider doing it today. Your life on Earth will be happier, fuller, and more satisfying, and you will get to look forward to a future in Heaven. Author Susan Elizabeth BallPosted on April 22, 2011 November 21, 2012 Categories Christian Life, FaithTags celebration, Christ, Christian life, Easter, Good Friday, Jesus, Jesus Christ, postaweek2011, resurrection4 Comments on I Serve a Risen Saviour! Steve and I are in the stage of life where our children have left home and are starting families of their own. We became grandparents nine months ago. Most of our friends are grandparents or about to become grandparents. It is a wonderful time of life. Yesterday, I attended a baby shower in celebration of the impending arrival of a friend’s first grandchild. The mother-to-be, Jessica, is a former student of mine. She and her husband glow when they speak of their son, growing in his mother’s protective womb. Although the child won’t be born for a couple more months, he is very much loved–not only by his parents, but also by his grandparents and great-grandparents, aunts, uncles, and cousins. From the first announcement that a child was expected, all who know this family have rejoiced with them and celebrate that a new life has been conceived. We experienced this same joy and anticipation during the months leading up to Daniel’s birth. We loved our yet-to-be-born grandchild from the first moment we learned that wonderful news that our beautiful daughter-in-law was pregnant. We waited in eager anticipation for the arrival of the “expected” baby. Every moment we spend with him is one of joy and pleasure. We are thankful for this wonderful gift God has given our family. We spent this afternoon with our grandson and some extended family members. One of them gave Daniel a beach ball to play with. Daniel squealed with delight as he held the ball. When it rolled from him, his father would pick up the ball and bounce it off Daniel’s head, eliciting howls of laughter. We delighted in watching the pleasure Daniel derived from the ball. His pleasure was contagious and brought smiles and laughter to everyone. As parents and grandparents delight in their offspring, so God delights in and loves his children. “How great is the love the Father has lavished on us, that we should be called the children of God!” (1 John 3:1) As much as we love our children and our grandson, our love does not compare in magnitude to the love God has for us. God loved us so much that he sent his son to take the punishment for our sins, allowing us access to God and a future with him in Heaven. “For God so loved the world that he sent his one and only Son, that whoever believes in him shall not perish but have everlasting life.” (John 3:16) God offers his salvation to all. God created each person that has every lived to be his child and to enter into fellowship with him. He desires each of us to accept Christ’s free gift of salvation and to become a child of God. If you would like to experience the delight that comes from being a child of God, you only have to admit that you are a sinner in need of salvation, believe that Jesus died on the cross to pay for your sins, and confess Jesus as Lord of your life. It’s the best decision you will ever make. Won’t you become a child of God today?